I’ve been working so hard making things, that I haven’t had time to post them! 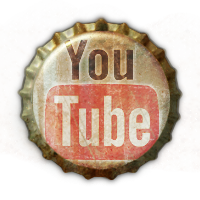 So I’m going to do an all-in-one pinterest show! I’ll try to make sure I give credit to where all my ideas came from . . . These have worked out great! Click here for directions. Here are a few of my own ideas that have come to life . 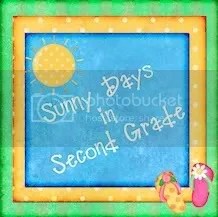 . .
School is back in session for me! 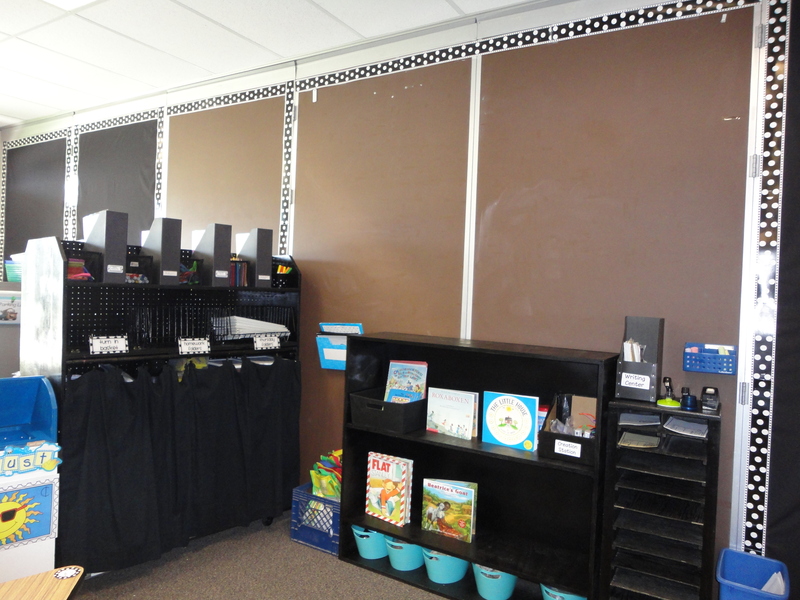 Last year I did a complete classroom makeover, (click here to see how I did it) so this year all I did was get myself more organized, make a few adjustments and improvements, and I was ready to go! 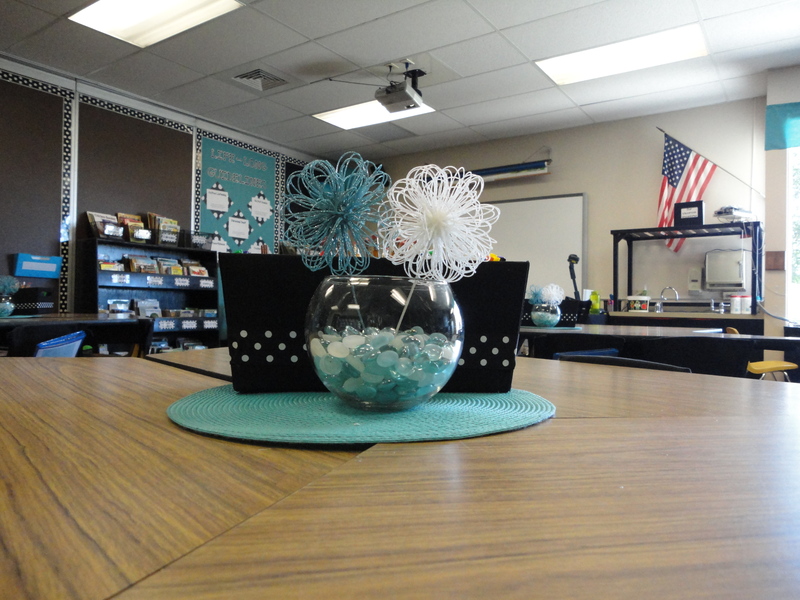 I took a class last summer that inspired me to create a classroom environment that was relaxing and inviting. 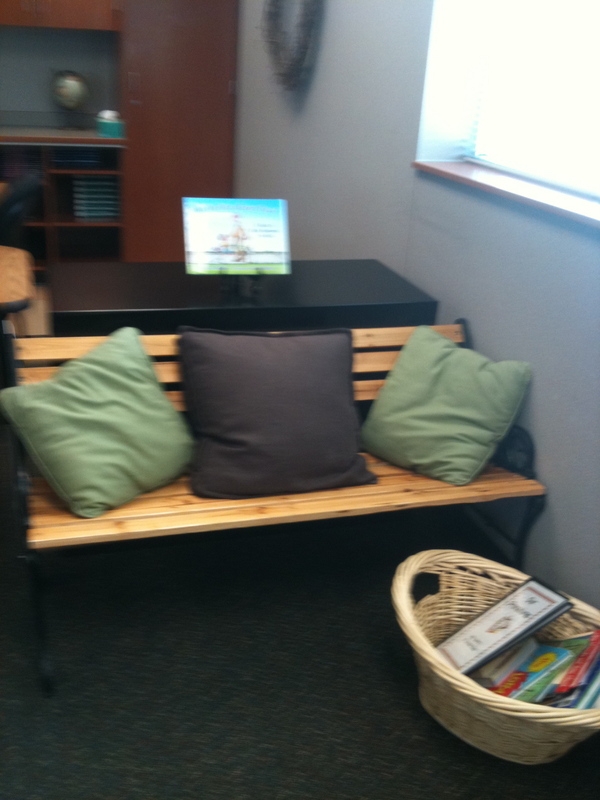 The idea is to make it a comfortable place for the kids and I to spend so much of our day. Although lots of colors and stuff can be fun, they can also be distracting. 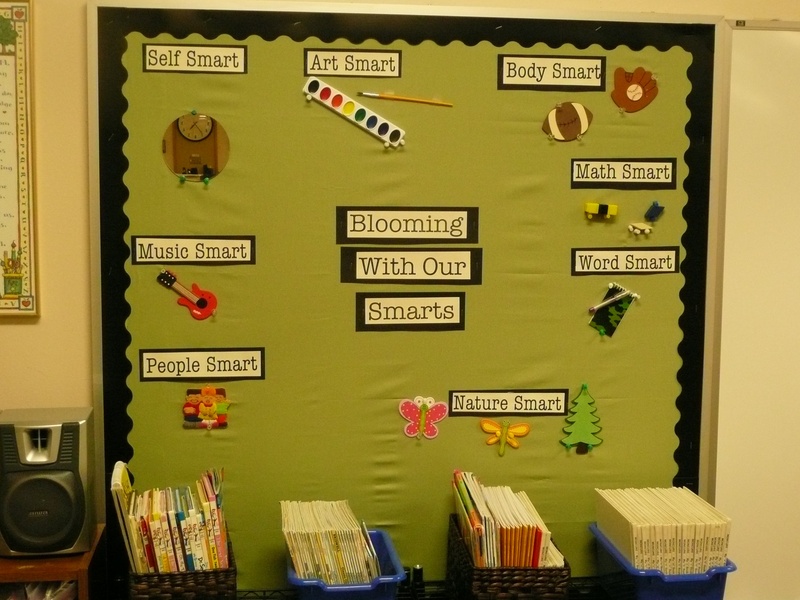 I save the colors and “stuff” for my smartboard lessons and the students’ creations. When the kids and parents walked into my room for beginning of the year conferences, that is exactly the reaction I got from many families! 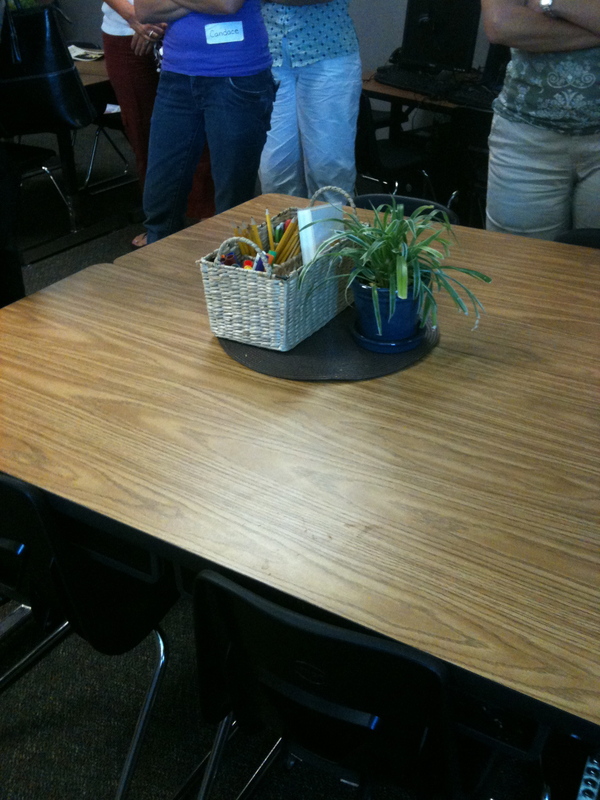 The kids sit at trapezoid tables that have desks built in underneath. 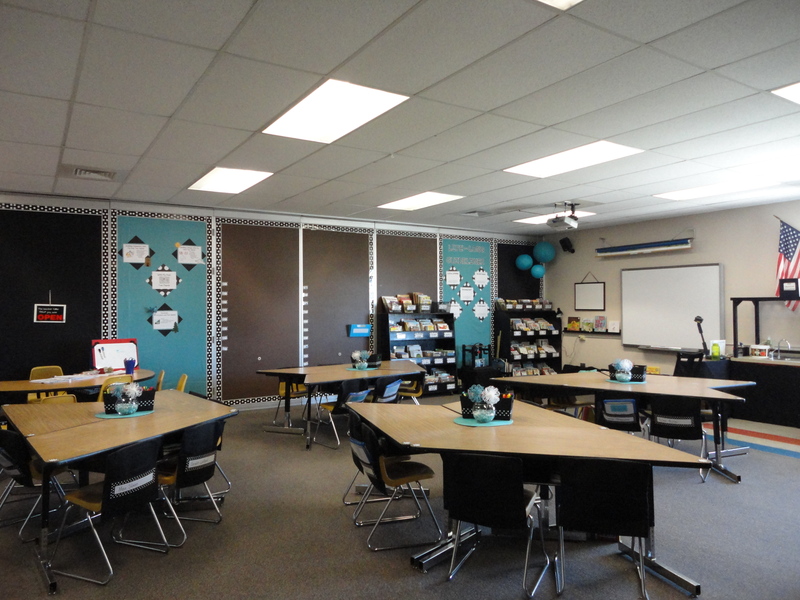 It gives the kids more room to spread out, and the way the trapezoid tables fit together give us more space in the room. 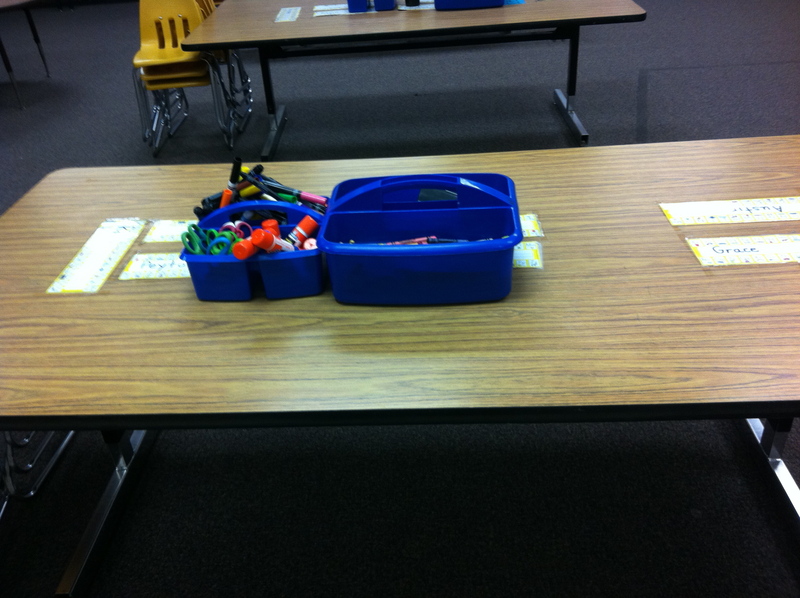 These 4 table groups sit 24 kids! I also have a wall flower plugged in that gives off a fresh clean smell that really adds to the ambiance! This is in the center of each table group (I have a total of 4 table groups with 6 kids at each table). 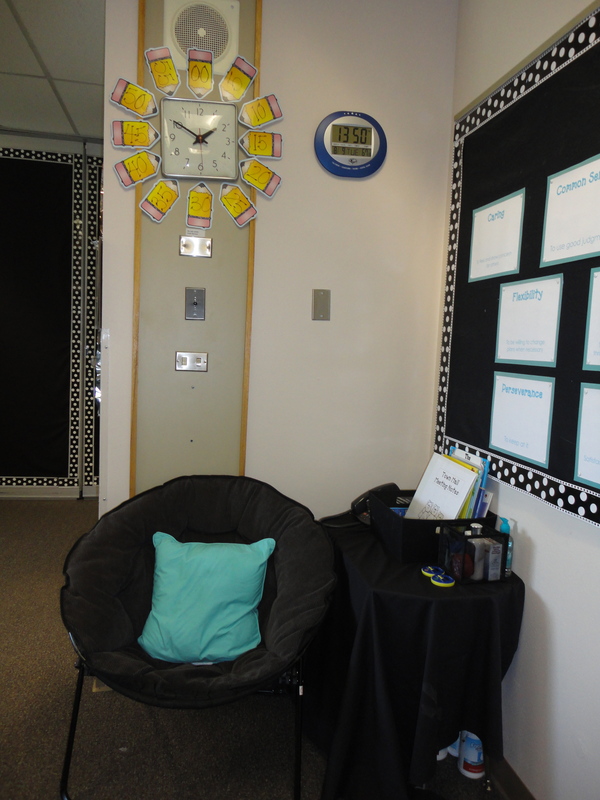 In the black tubs are supplies that they all share: pencils, markers, small pencil sharpeners, a book of classroom procedures, sticky notes, and a date stamp. The shelf (with the books displayed on it) is my immersion area. 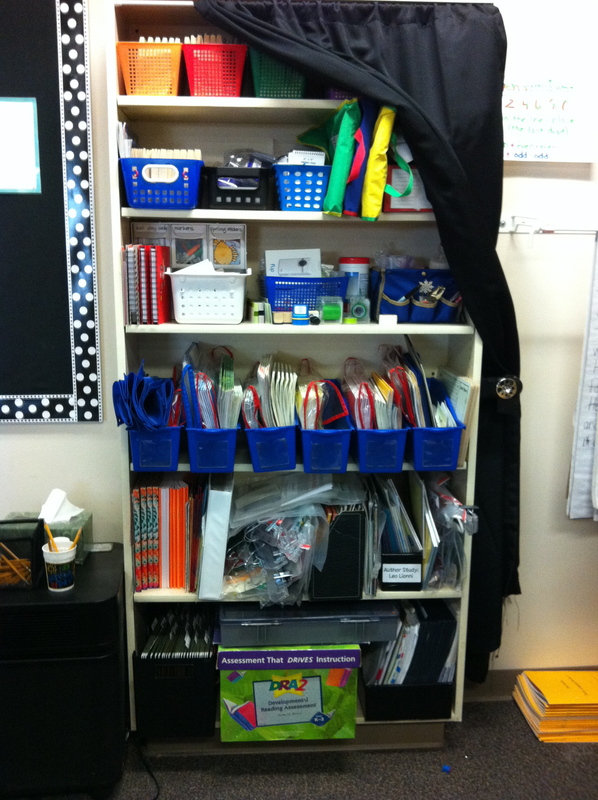 This is a place where the kids and I bring in things that are related to what we are studying (usually a science or social studies concept) and add them to the shelf for everyone to explore during that unit. The blue tubs underneath are part of the science center. They hold bones, birds nests, rocks, shells, magnifying glasses, and anything that the kids can find that they would like to investigate more closely (as long as it is not alive or decomposing!). The tall shelf next to it holds a lot of writing supplies. 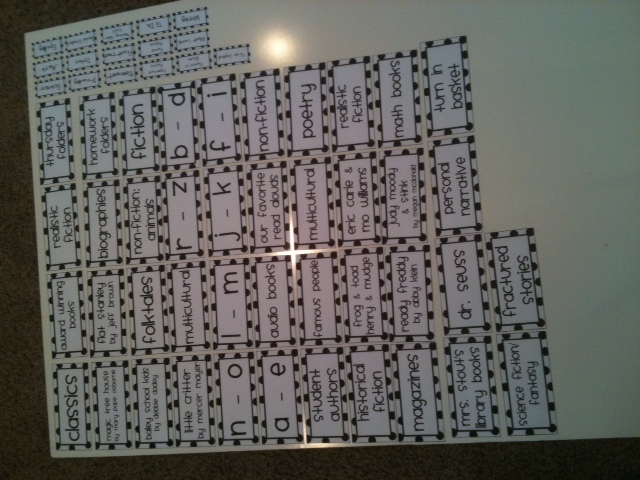 Each slot will hold different colors of construction paper, and there are staplers, tape, and word dictionaries on top. 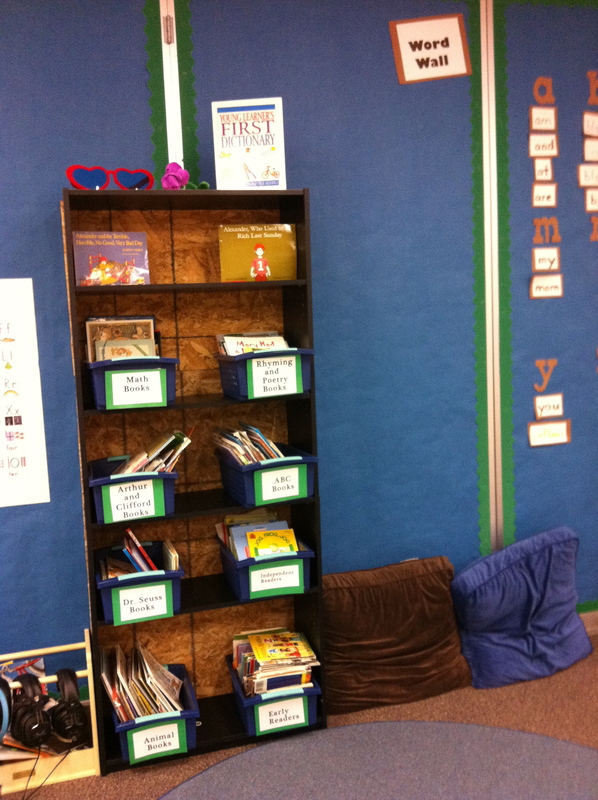 The big shelf on the other side is for our turn in basket, homework folders, and Thursday folders. On top there are more writing supplies such as dictionaries, markers, squiggly cutting scissors, sticky notes, etc. You can also see our classroom mailbox on the left. 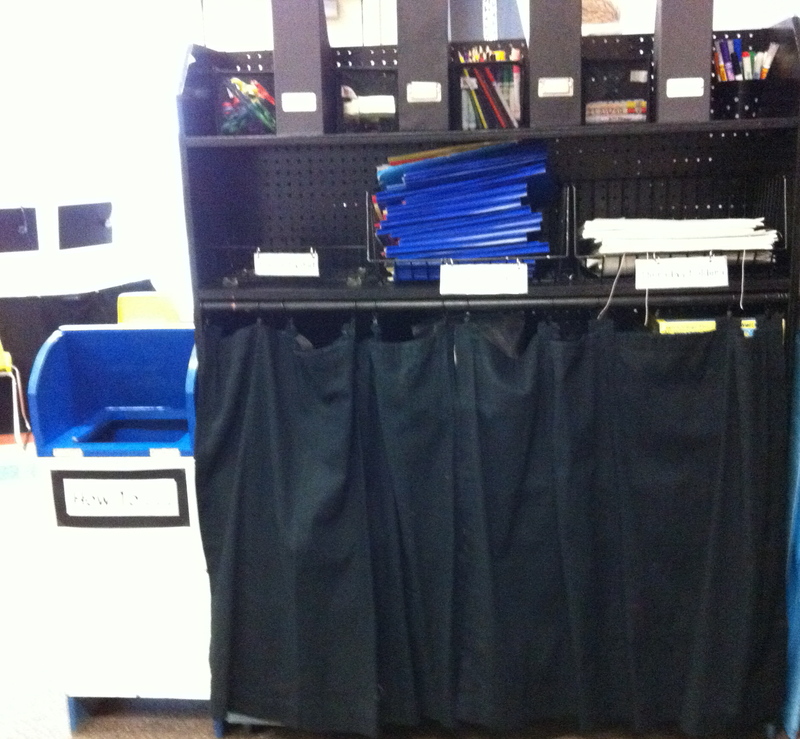 Behind the curtain is our math supplies . . . I read Debbie Diller’s Book Math Work Stations this summer, and I’ve started using math stations the way she suggests in her book, and I love it! 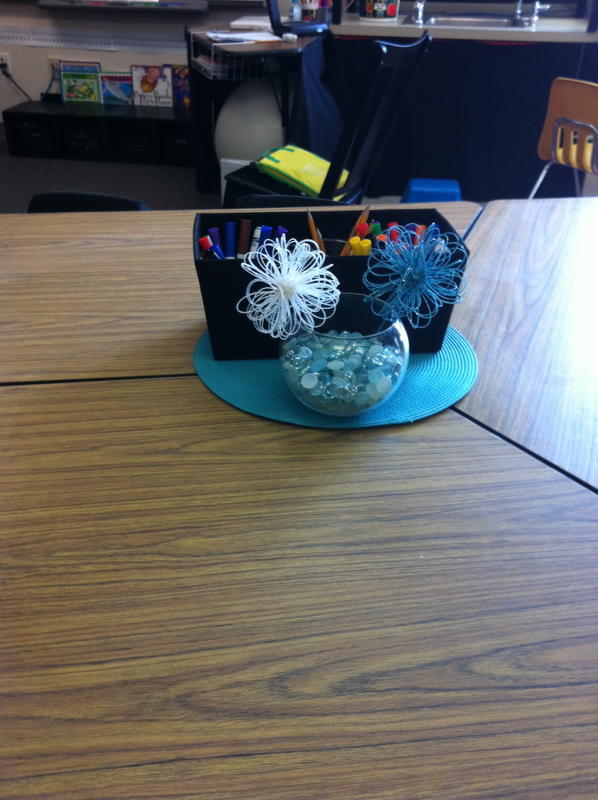 You can see the tubs I’m using as my math work station ($2.79 at the Container Store! 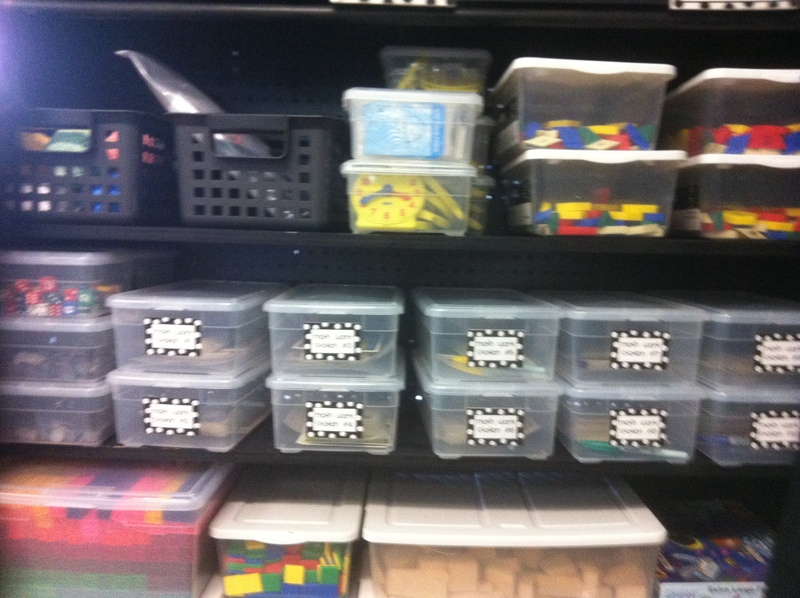 ), and our other math supplies. 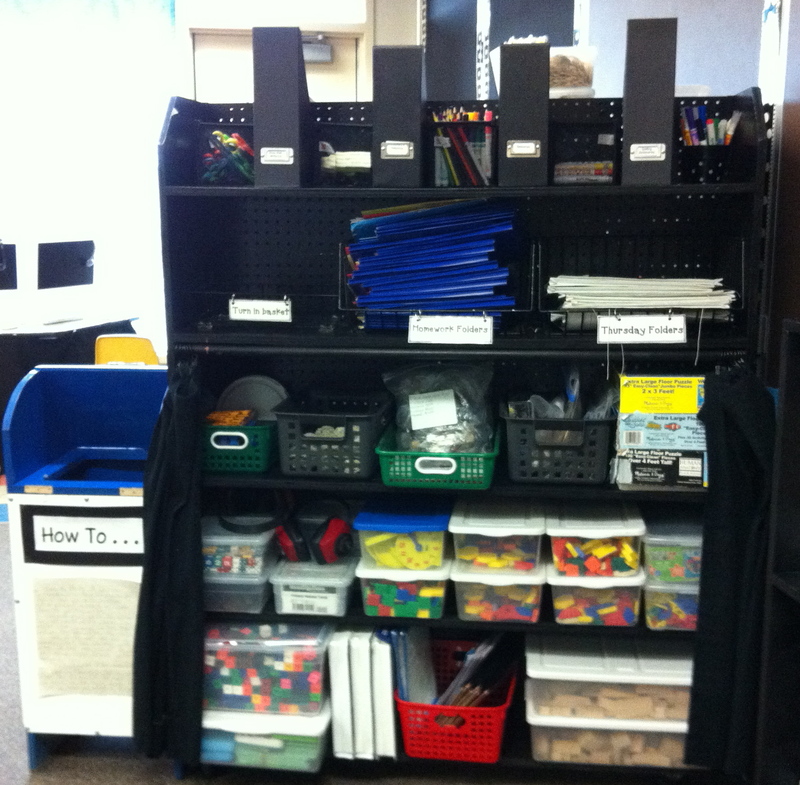 I’ve always used math centers, but I love organizing them in tubs the way Debbie Diller suggests! It’s so much easier. Everything they need is right there, and we don’t have to spend time messing around collecting all the supplies, and if they don’t finish that day, they just keep what they need in the tub and they can pick up where they left off the day before. I LOVE it! The picture just does not do justice to how amazing these labels are! Keep reading to find out how we made them. 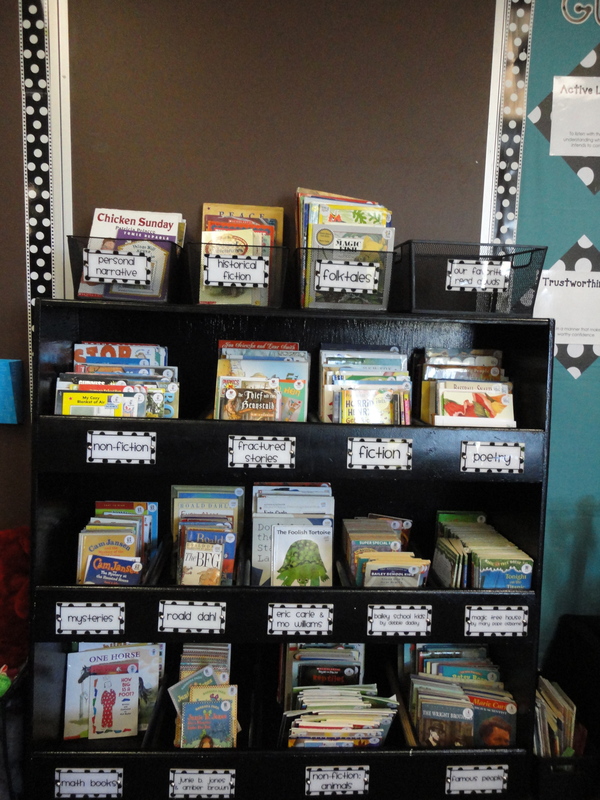 I also made a new discovery this summer that I think will change the organization of my library forever! I’m so excited! I have my books labeled in different ways. 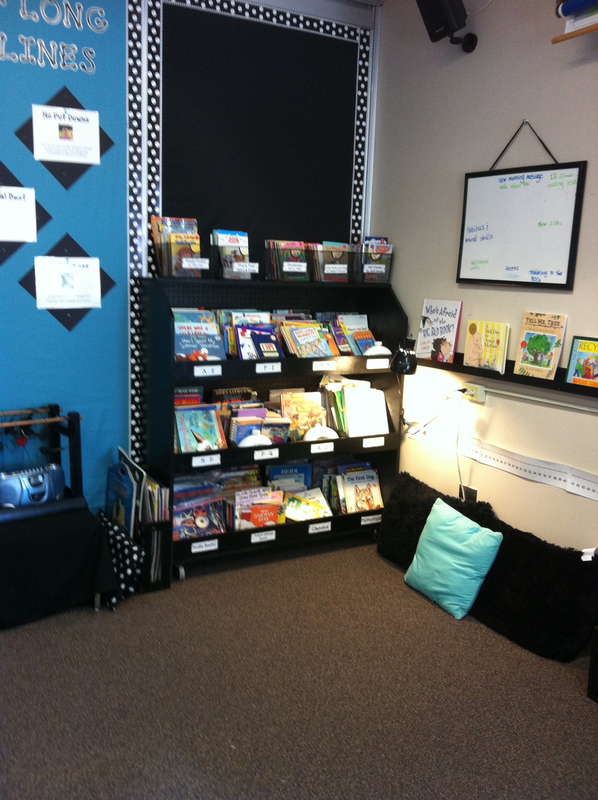 I have many different genres, authors, favorite series, favorite read alouds, and Guided Reading Levels — quite a variety. Because I have them grouped in many ways, it’s hard to find enough different colored stickers so the kids can keep them all straight–and they don’t. By the end of the year, I always find many books out of place. But this year should be different! I found circle stickers from 3M that you can run through the printer! I created my own labels complete with picture AND name! Now they have to get the books back in the right place (I hope) because they have words and pictures for reference. I think this is really going to make a difference! 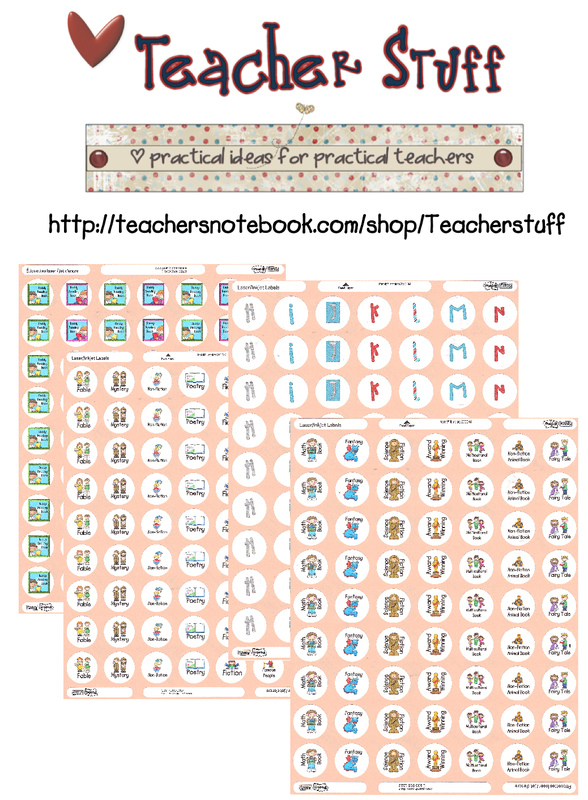 I have the labels I made on sale at the Teacher Stuff store if you’d like to try it too! 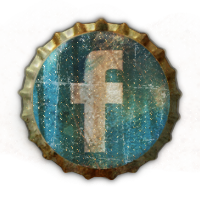 (It’s just a digital item, so you will have to buy your own stickers) Click here to buy them. I do not have a whiteboard because I have a I have a smartboard instead, and they wouldn’t both fit. Sometimes I could really use a whiteboard too, but I have found ways around it. The frame on the wall is holding a 20×24 whiteboard where I write our agenda for the day. My room is not that big, so to make the most of my space, my meeting area and library space overlap. I don’t really use these at the same time, so overlapping them allows me to make only one big space in my room instead of two. Sorry about the quality of the picture, but I have the most beautiful view out my window! I just can’t bear to close the blinds! I don’t have my desk at the front of the room because I only sit at it when the kids aren’t in the room. I just couldn’t get rid of my desk completely because I’m not organized enough without a space to put my stuff. 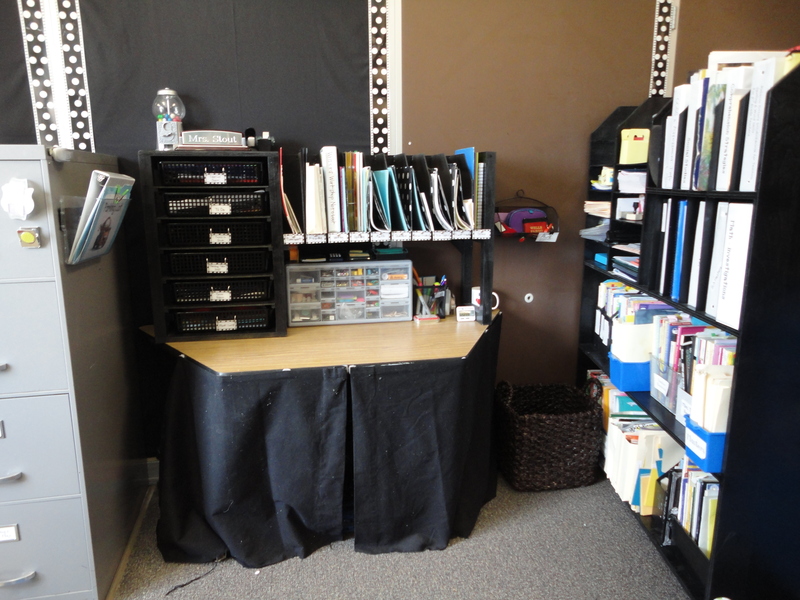 I did downsize several years ago to a trapezoid table which takes up much less space than the big bulky teacher’s desks we have, so I just have my stuff in a corner out of the way. I have a toolbox drawer organizer from the Container Store that I keep paperclips, sticky notes, staples, etc. in since I don’t have drawers. I actually like it so much better than drawers! It keeps me so organized! In the book Alexander and the Terrible, Horrible, No Good, Very Bad Day Alexander wants to move to Australia to get away! So if the kids are having a terrible, horrible, no good, very bad day, (or if they aren’t feeling well) we have a mini Australia where they can take a little break and compose themselves before they come back to join the rest of the group. 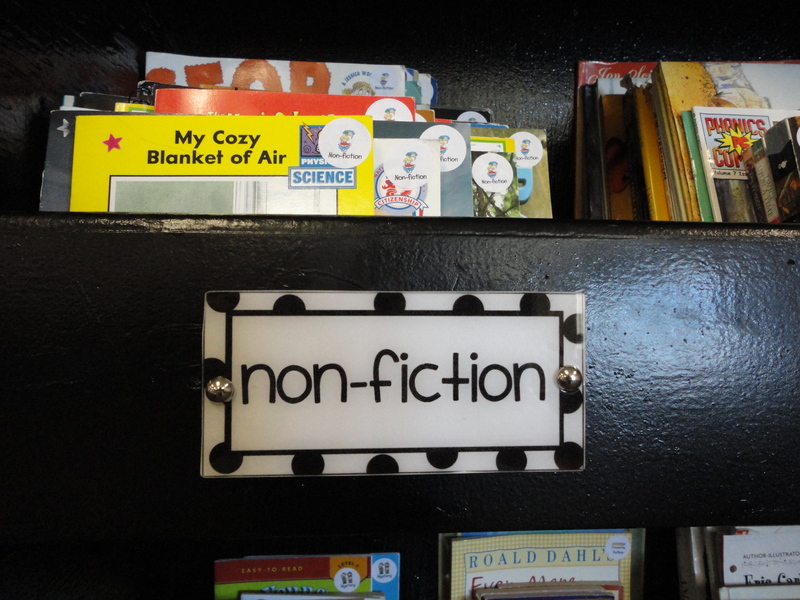 There are also band-aids, Vaseline, and books about getting along with others and following the rules. Once I have taught the students to work independently at their math and literacy work stations, I begin my guided groups (as I’m sure you do). 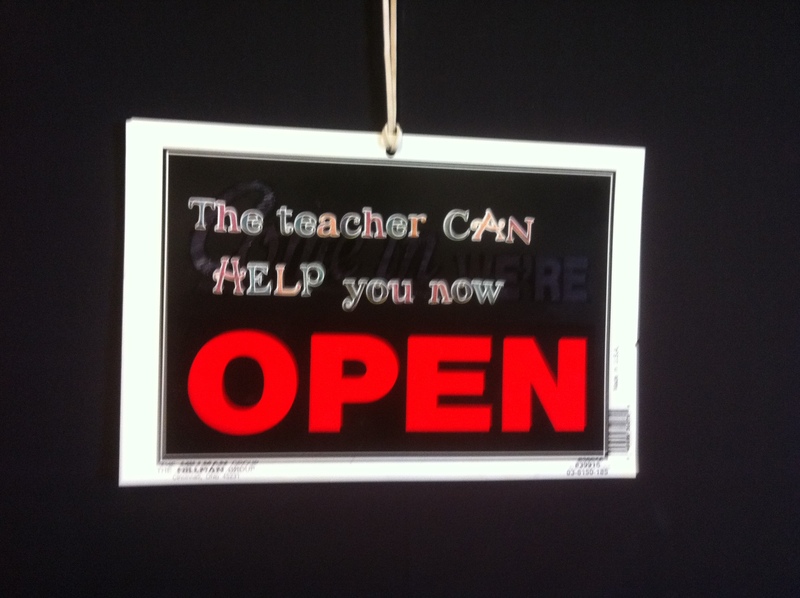 I use this sign to remind students that if I am working with a group and my sign is closed, I cannot help them and they have to keep working. If they try to interrupt (which they always do in the beginning!) I just point to my closed sign and keep working with my group. It works! They learn quickly when I am available for questions and when I am not. I just got an open/closed sign at Home Depot and added stickers for what I wanted to say. The sign I got said “Come on in” on the ‘open’ side, so I just colored over it with black permanent marker. My sign has lasted for 7 years so far! 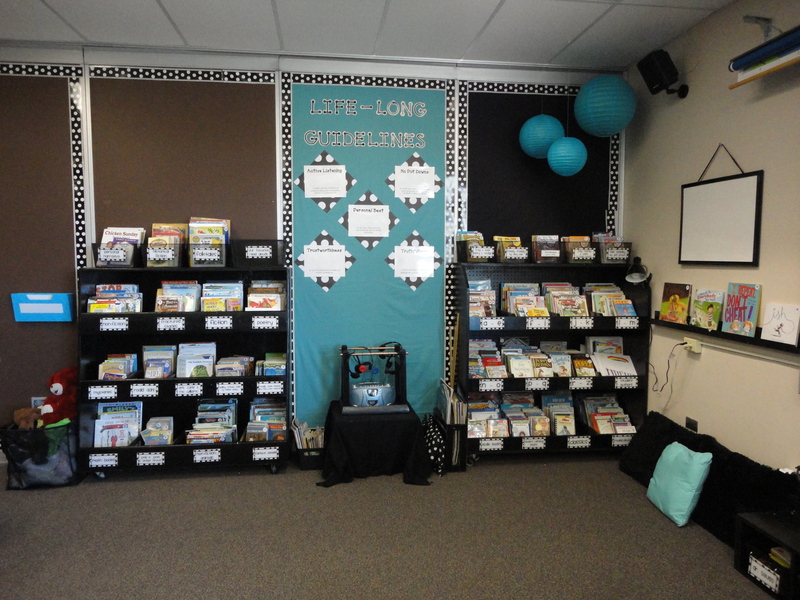 I got this idea from Debbie Diller’s book Math Work Stations, and I made it my own by adding my own color scheme, so you can too! 1. 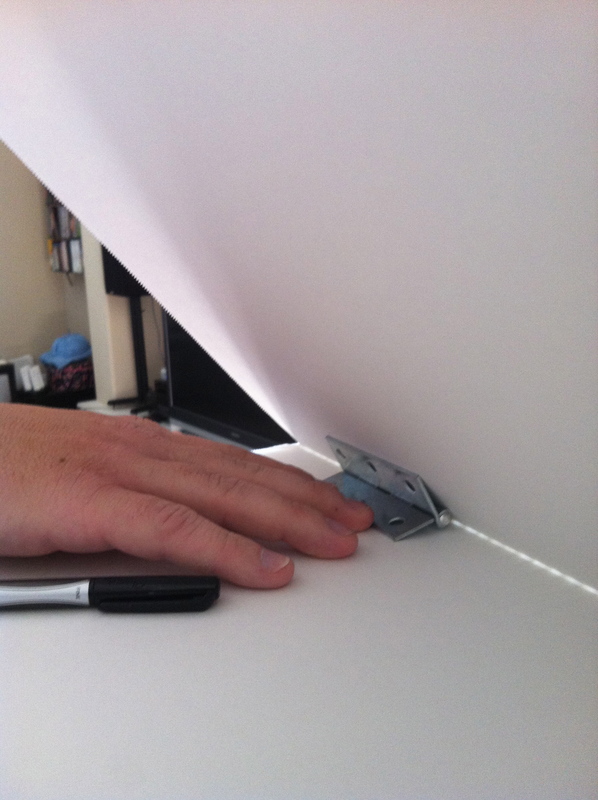 Flip the hinges so they won’t close all the way, and put them under one of the flaps on the poster board so it sticks out like an awning. 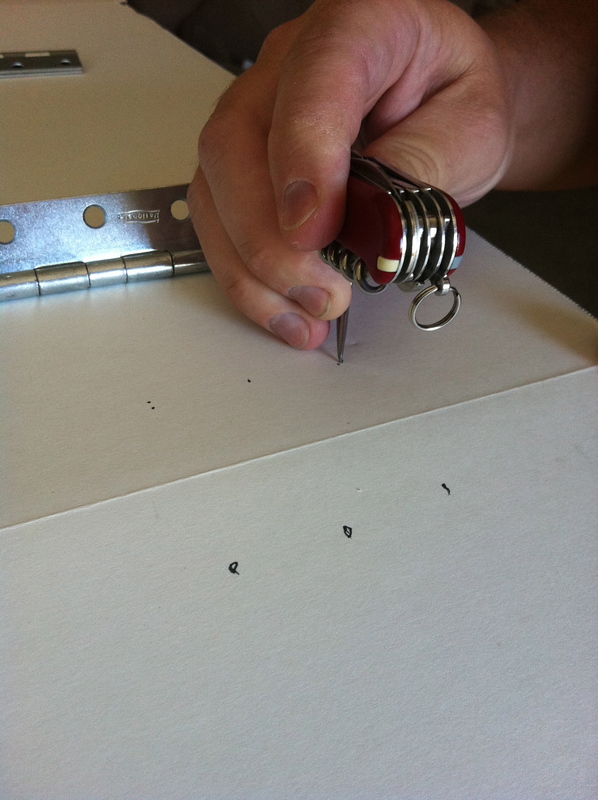 Use a pencil to mark the holes where the brads will go. 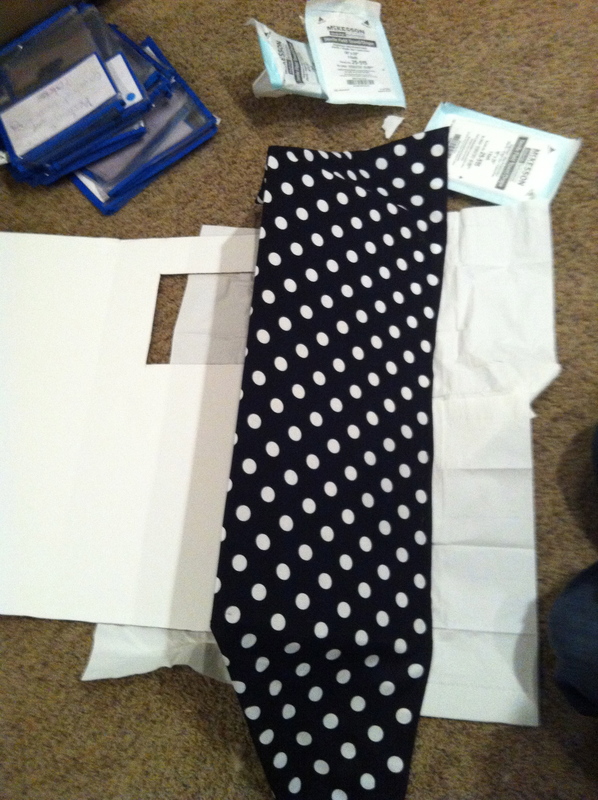 Poke holes where the brads will go and attach the hinges to the poster board with glue and brads . 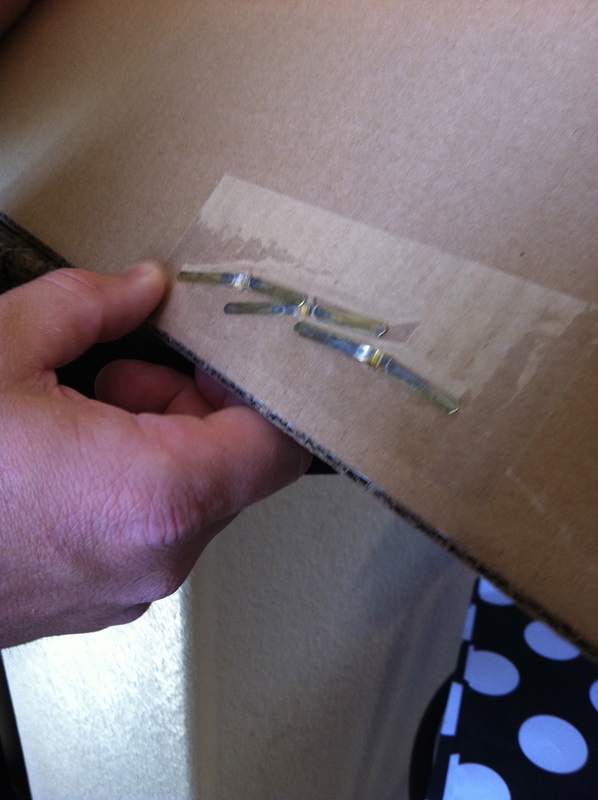 . .
We also used packing tape hold the brads flat on the back. Now you have an awning ready to decorate! After we got this far, my husband realized that we could have accomplished the same thing by gluing a dowel rod in the bend, and that would probably be simpler! 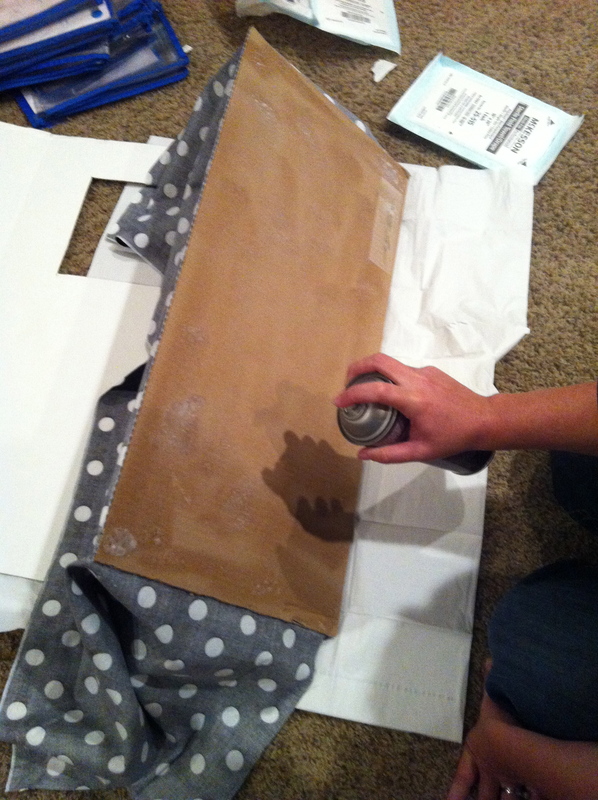 To attach the fabric we used spray adhesive on the cardboard and smoothed the fabric over it. (I had to cut out a little window in my board so I wouldn’t cover my name plate on the wall). 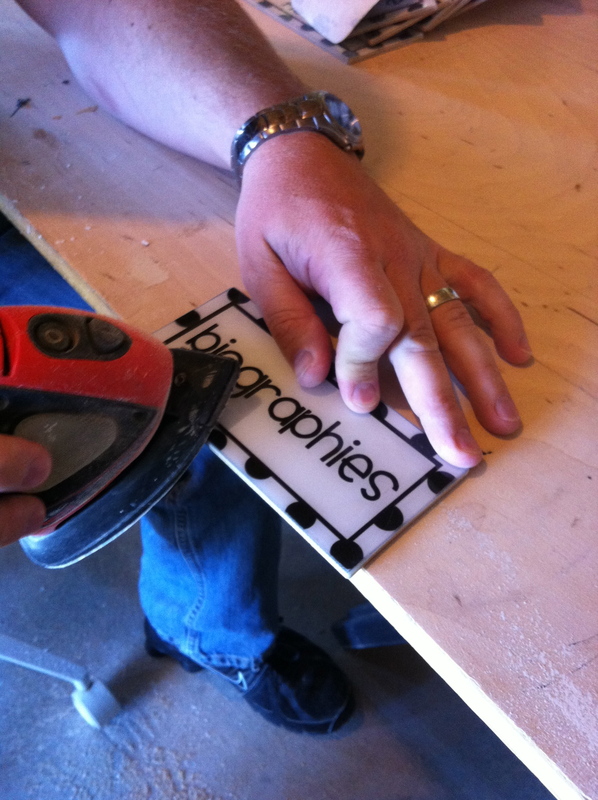 Then I hot glued the finishing touches! 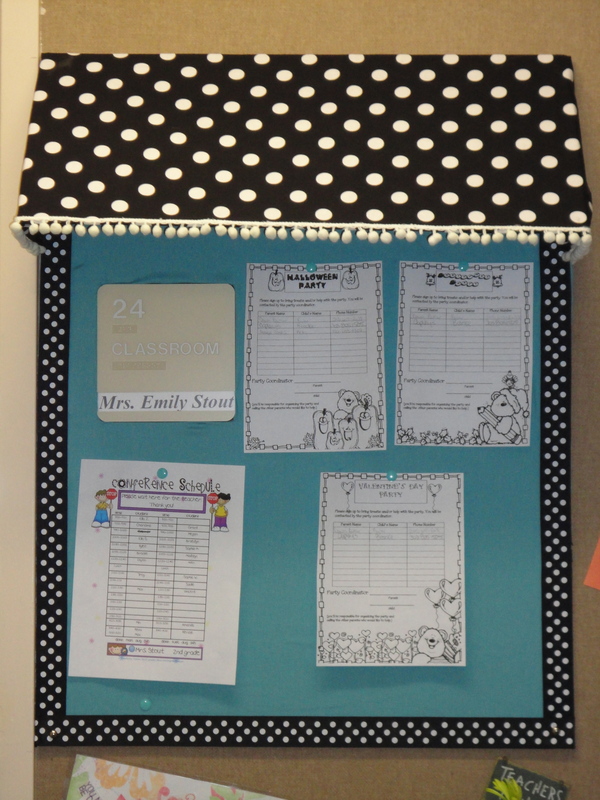 Now I have fun, eye-catching display to welcome students and parents to my room! These labels really are so amazing! The picture really doesn’t do it justice. They were totally my husband’s idea! He is such a rock star! 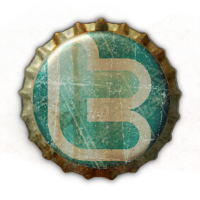 These labels do take a bit of work up front, but it will be worth it because they should last you forever. We made a few mistakes and had a few practice labels we had to throw away before we got the final product, but I’m SO pleased with how they turned out! Hopefully I can give you some advice that will save you from some of our mistakes! 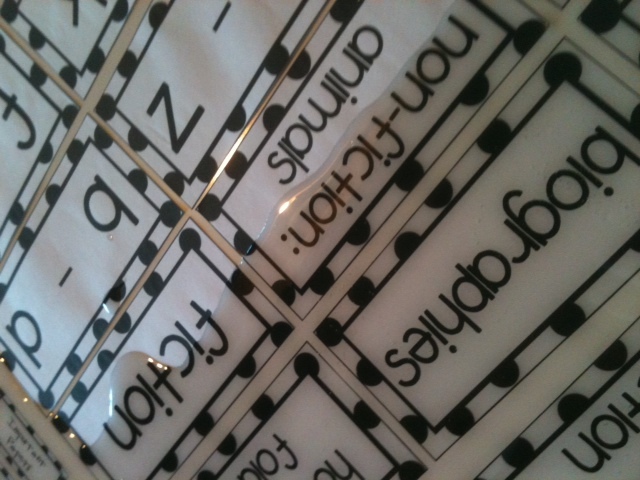 Stick the labels down to the white board using double sided tape. Make sure you get the very edges! 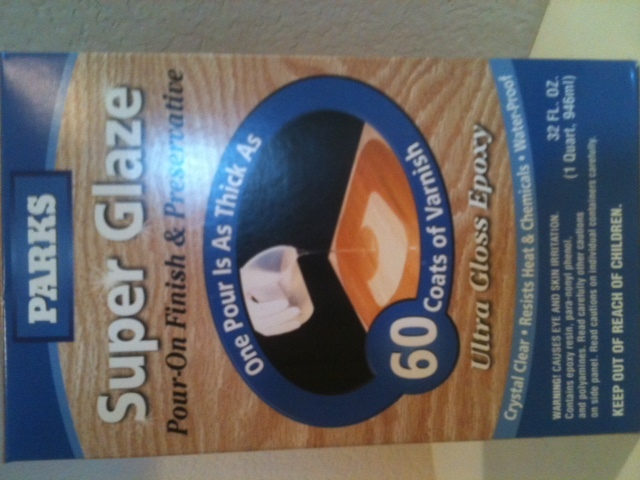 Pour on the epoxy, but be sure to mix it EXACTLY as the directions say. We had one batch that we did not mix properly and it didn’t set correctly–it stayed tacky, so be precise! Give it about 24 hours to set just to be safe. Now you’re ready to cut them apart. 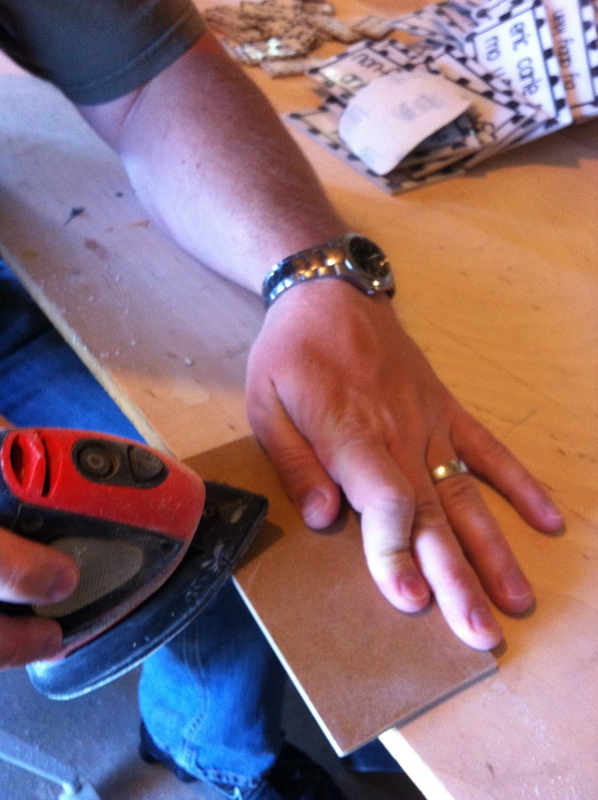 My husband used a band saw to cut them out, but a table saw, skill saw, or jigsaw would work too. 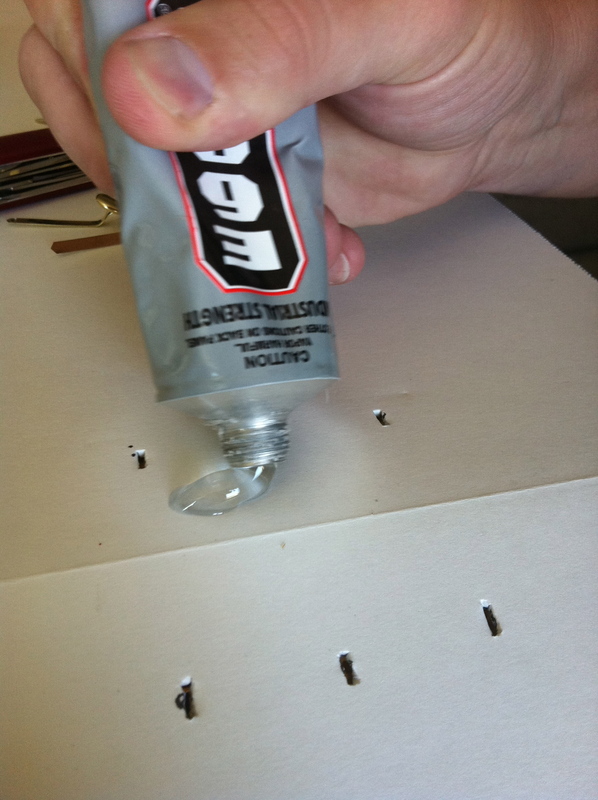 Then take off the rough edges, and drill a hole for the tack to go through, and they’re ready! 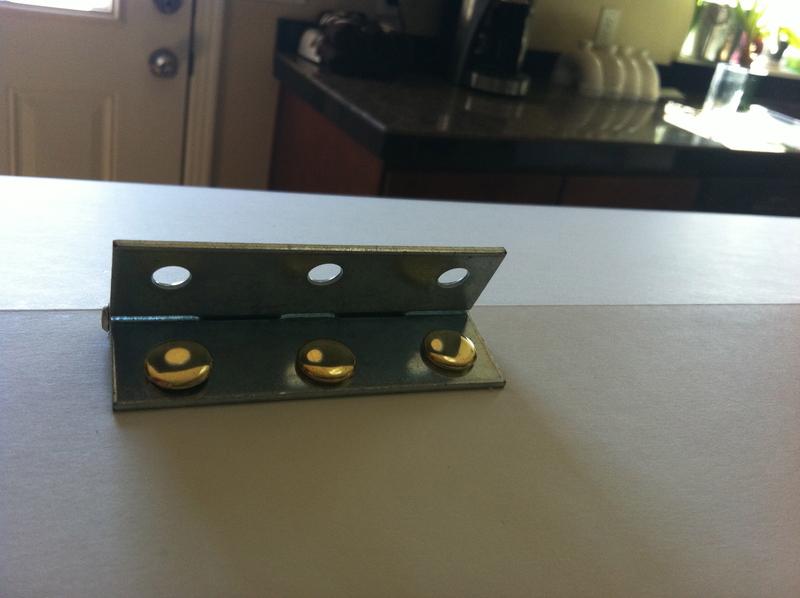 Because the epoxy is so thick, the furniture tacks were long enough to hold the labels up, and they looked nicer than screws or nails. 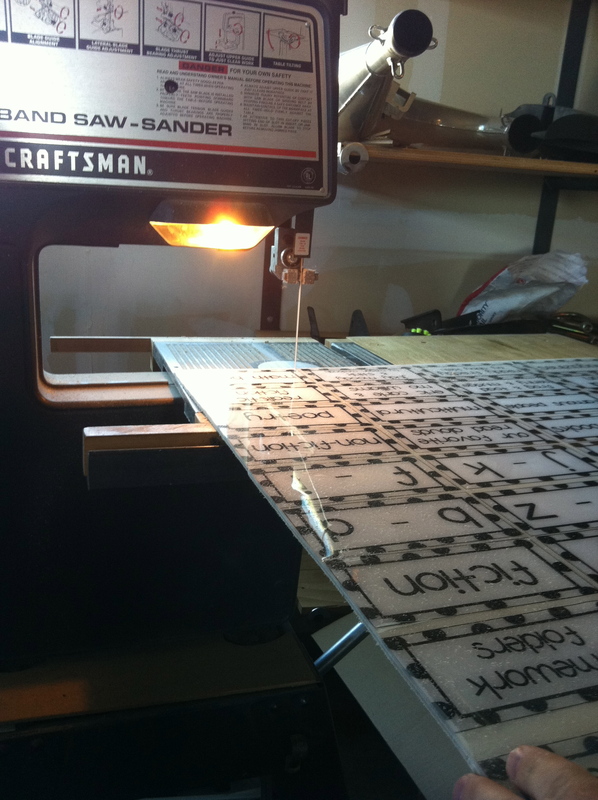 Now you’ll have extremely durable, professional looking labels! Not sure where to start? Brain research expert, Eric Jensen, suggests using a warm yellow on 3 walls and a light blue color on the other wall for a positive impact on student behavior and cognition. 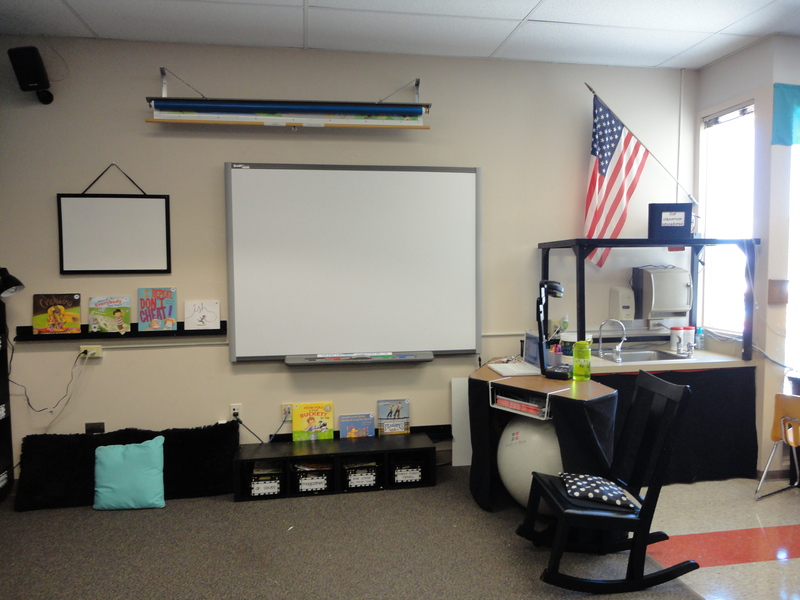 When designing your classroom, keep in mind that according to Jensen, warmer colors such as red and yellow stimulate students, and cooler colors such as light blue have a calming effect. Cover the Clutter. We’re teachers. We have lots of “stuff”. I’ll be honest, I didn’t think it was a big deal to have my “stuff” stacked tidily on a shelf–until I saw pictures of it. I was looking at pictures from a classroom party, and in the background I saw all my “stuff” stacked tidily on a shelf. I thought, “That’s what my room looks like? !” From the pictures you couldn’t tell that my filing system was (somewhat) organized and that I could put my hands on what I needed whenever I needed it. (I guess that’s why our closets at home have doors!) 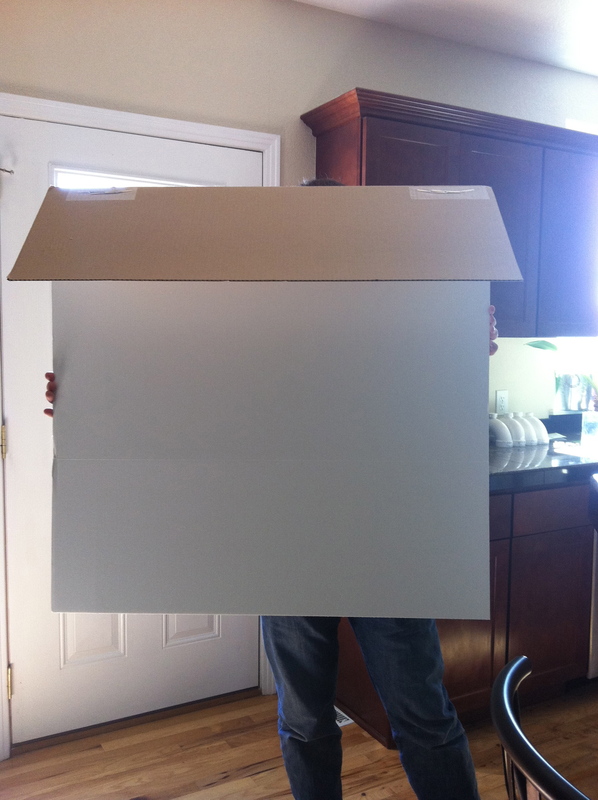 We need to have our “stuff” on hand, but you can cover it so it is not distracting. It can be as easy as purchasing an inexpensive curtain at Target that matches your room. 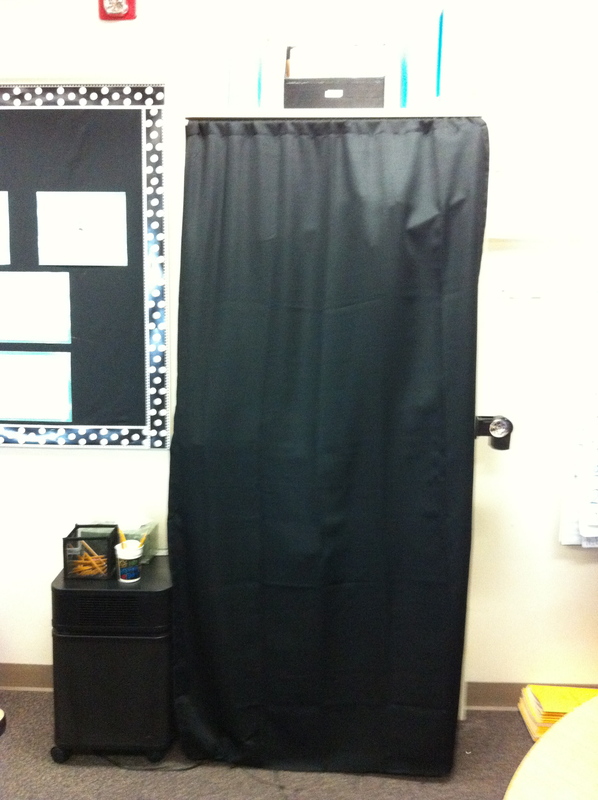 Check out the pictures to see what you can hide behind the curtains. You’d be surprised what a big difference it makes! Homey touches. 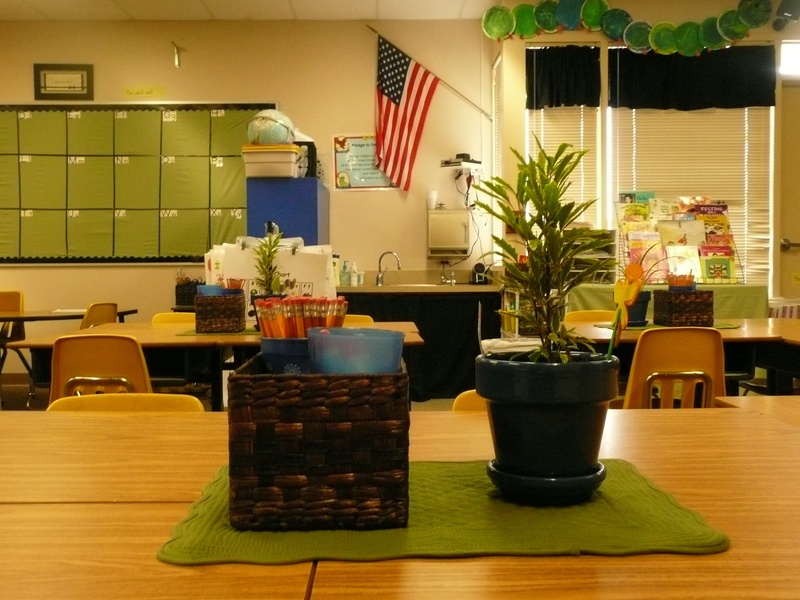 Adding homey touches such as a center piece in the middle of student tables, plants, pillows, and lamps make your classroom feel comfortable and inviting. Smell. Plugging in a $5 wall flower from Bath & Body Works may be subtle, but it makes a big difference. 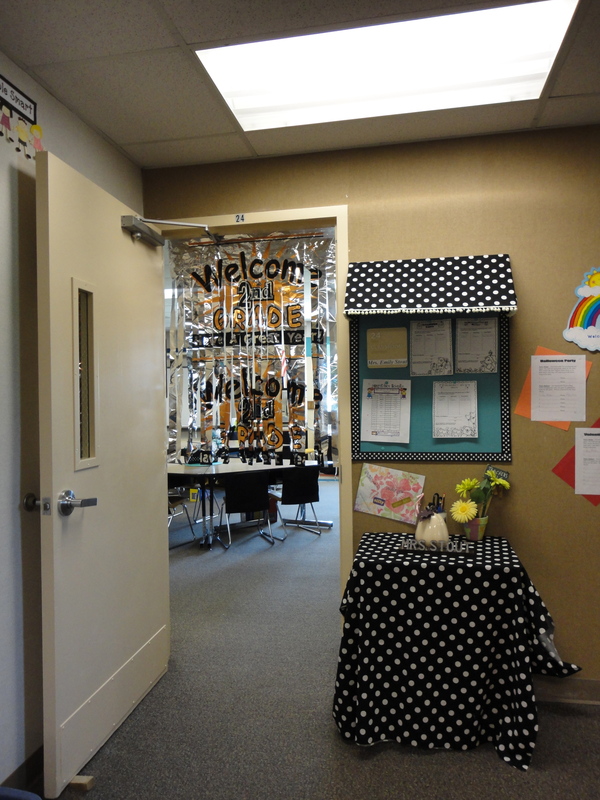 I have had parents, students, and teachers alike drawn into my room this year by the subtle smell of cotton blossom. I have had so many people take a big sigh of relief and tell me how much they just love being in my room. They say it just feels like a comforting place to be. Stick to a subtle and clean smell to keep your environment soothing. Stock up on peppermint at Christmas time because peppermint is a smell known for stimulating the brain. 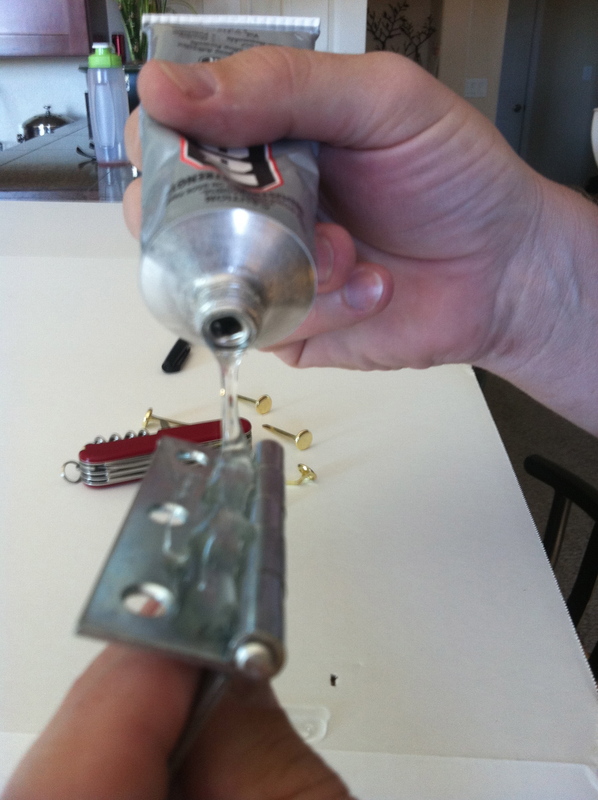 If you want a smell that packs more of a punch, get it in a spray bottle. When students are taking a test, you can spray your “brain smell,” (as my class calls it) to stimulate students brain. Sound. Eric Jensen (2005) emphasizes the negative effect of ambient noise, reverberation, and other acoustical problems in a learning environment. The soothing sound of white noise, such as classical music, nature sounds, a desktop waterfall, and fish tanks can mask the sounds you have no control over. 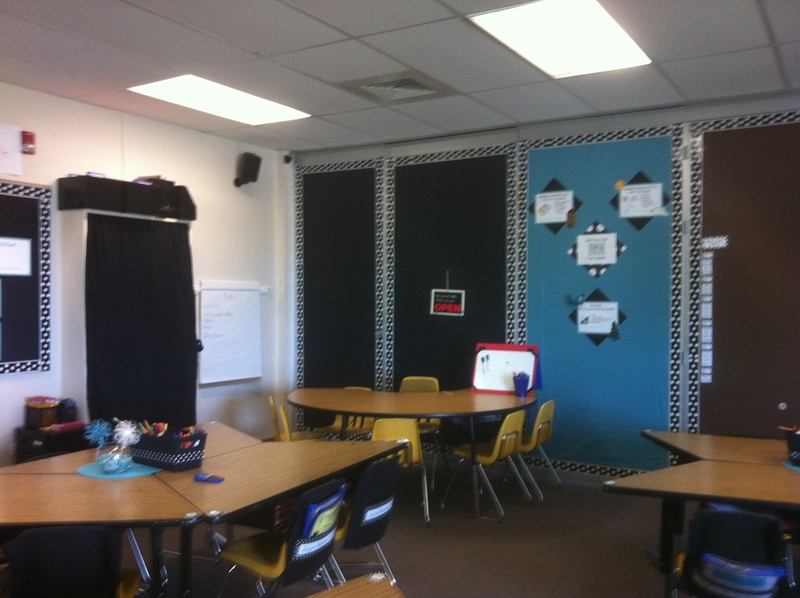 Using fabric on the walls can muffle those ambient sounds too. 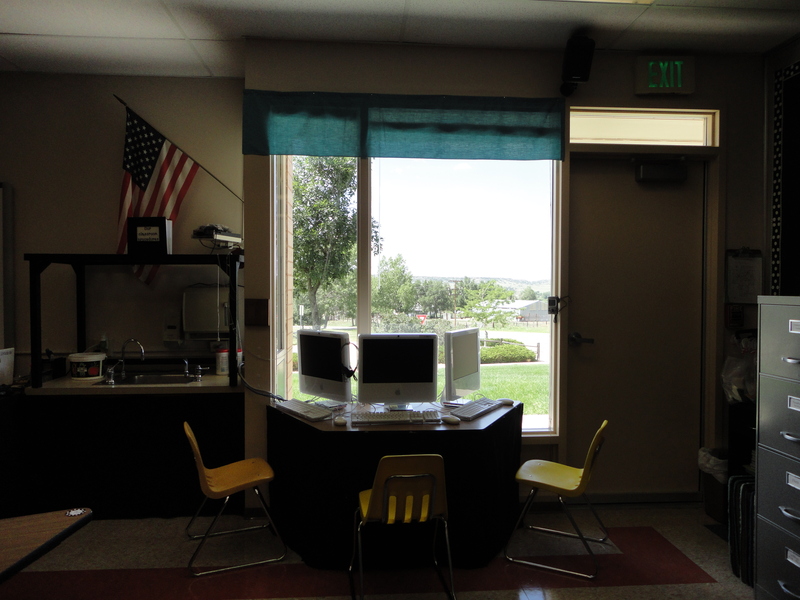 A few years ago, the PTO at my school purchased sound systems from Front Row for each classroom in our building. It is like having surround sound in the classroom. The teacher wears a microphone allowing all students to hear equally well throughout the classroom. There is also a connector for my ipod so I can play music or an audio book through the speakers for everyone to hear. Are your filing cabinets overflowing? No where to put all those lessons you worked so hard to create, but don’t use anymore? Can’t let go because “someday” you might use them again? It’s OK–go digital! Scan a copy of the things in your filing cabinet and save them to your computer. Many copiers can send a copy straight to your email. Check to see if your school’s copier has that capability. You’re more likely to find them that way if you ever do need them again. Use Evernote to organize your files. Evernote is a great FREE resource to save and organize anything you need. It saves notes, attachments, pictures, and it even lets you record voice notes and saves it in the “cloud” (virtual space on the internet). This means you can access it anywhere in multiple ways. You can open evernote on any computer, smartphone, or ipad and have access to your files. No more lugging your computer back and forth, saving to the server, or a thumb drive and hoping you have it when you need it. Evernote even has a “web clipper” that allows you to clip something interesting you find online, and it instantly saves the page and the URL to evernote — it’s that simple! That’s how I save my favorite websites that I like to use in the classroom. You can “tag” your files in multiple ways, so it keeps you organized and everything is easy to find. For example, I clipped a website that had great interactive science games for kids, and I tagged it “education,” “website,” and “science.” I can click on any of those tags and find it. Then I can open that website on the student computers and bookmark it. Evernote is going to be teacher’s new best friend! District resource — my district has a craigslist-type list where anyone in the district can advertise things they have for sale. This is nice because you know the people interested are local. That makes it easier to deliver things to them. Teacher Pay Teachers — This scholastic-sponsored webiste has many resources made for teachers, by teachers from all over the country. If you sell on this site, the shipping is paid for, but you have to share a percentage of your profits. Good luck with your spring cleaning! Jensen, E. (2005). Teaching with the brain in mind second edition. Alexandria, VA: ASDC. 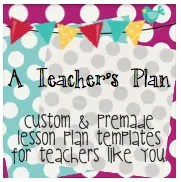 Get Your Lesson Plans Organized This Year! Lesson Idea: How are people transformed through their relationship with others? 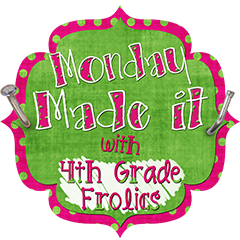 Monday Made It DIY #3: Discovery Journals and a Color "Wheel"
Why teach a fairy tales and fables unit? Just in Time . . .
A Few of My Favorites: Check these out! Over 35 and still learning. A lifetime of it. Eventual novice to expert. Teaching and learning for great results!